Pescos, Lorenzo Rule MILO-Metro Manila | JustRunLah! 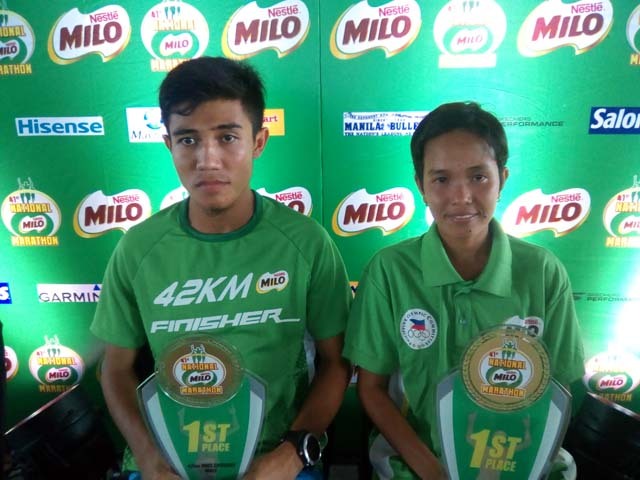 PASAY CITY – Fresh faces topped the 41st National MILO Marathon Metro Manila qualifying race held Sunday morning (July 30) at the SM Mall of Asia grounds. Rafael Pescos and Cindy Lorenzo emerged as new forces to challenge the current holders come the National Finals set December 3 in Cebu City. Pescos, last year’s Cebu leg champion, timed 2:38:27 in edging out multi-titled Eric Panique (2:43:10) and 2014 and 2015 Cebu champion Noel Tillor (2:47:31) in the centerpiece 42.195-kilometer race. Since his native Cebu will be hosting the Nationals, the former Southwestern University Information Technology student and varsity athlete and his friends had to find another venue to qualify. 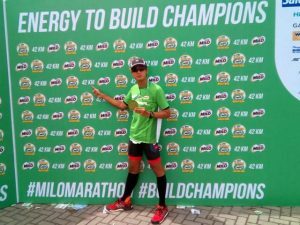 Lorenzo, one of the stalwarts of Team Soleus, finally nailed a championship in the full marathon with a time of 3:16:15 to beat Lany Cardona (3:23:38) and Lizane Abella (3:29:48). The Taguig City resident and mother has been a regular fixture in MILO events with recent highlights of taking Third Place in last year’s Metro Manila 42-kilometer qualifier and winning the 2015 Tarlac qualifier. Sunday’s race also gave runners the option to earn tickets to Cebu via the 21-kilometer route with Gregg Vincent Osorio (1:16:00) and Jhanine Mansueto (1:35:00) emerging as the distance’s fastest. 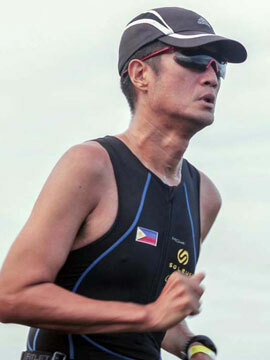 Other champions in the other categories were Jackson Chirchir of Kenya (31:59) and Diane Klein Ong (46:57) in 10 kilometers, Rustom Nava (16:56) and Maricris Naciluan (21:12) in five kilometers and Mark Daniel Tanbot (10:44) and Samantha Nicole Caneba (12:01) in the three-kilometer race for kids aged 12 and under. Life can be likened to a marathon hence this year’s MILO Marathon encourages runners to run and learn together. For each of the 32,000-strong that answered the starting guns in the various distance categories, there are the same numbers of lessons learned. 26 career marathons and counting and first time to run 42.195 on back-to-back weekends. For Pescos, the last six months greatly improved his self-confidence and determination. Meanwhile, Lorenzo learned to focus better and increase her patience and discipline. Definitely, the newly-minted champions discovered the winning energy formula. They hope to use this further as they challenge current MILO King Jeson Agravante and MILO Queen Mary Joy Tabal in the Nationals. The next MILO qualifier will be a week from now (August 6) the Clark Parade Grounds in Angeles City. The Philippines’ premier running event will then stay in Central Luzon with Tarlac hosting the August 13 regional qualifier.